There was only one item on my youngest's wish list this year. She is horse C-R-A-Z-Y. 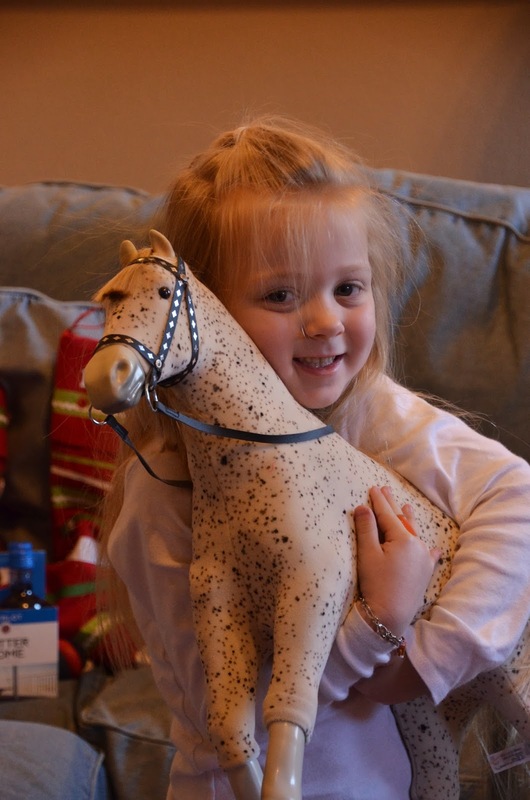 She set her dreams on a specific horse, named Picasso, from the American Girl store. Christmas morning was VERY merry and bright. But if you've ever shopped at the American Girl store, you know that merry and bright comes at a price. I actually feel a little jipped to be honest. For what I paid to spring him from the store, I feel like Picasso should do a little more than just stand around.....like maybe help with a load of laundry or two. Grandparents on both sides do a superb job of spoiling my children, so I get off on easy street when it comes to shopping for my kids. Picasso was my only purchase for the little one, but I wanted to have a few "extras" just for fun. So, I got some bright scraps of flannel and fleece and a pack of pink bias tape and set out to kick up Picasso's fashion sense. My son works at a horse barn, and every time we drive up there to drop him off, she comments on the feed bags and horse blankets. I drafted simple patterns, and used velcro attachments so it would all be easy for little fingers to use. She was thrilled, and that made my morning. I wasn't the only one hard at work on top secret projects. I found plans on the internet for a horse barn, and enlisted Papa to help me create Picasso's Palace. 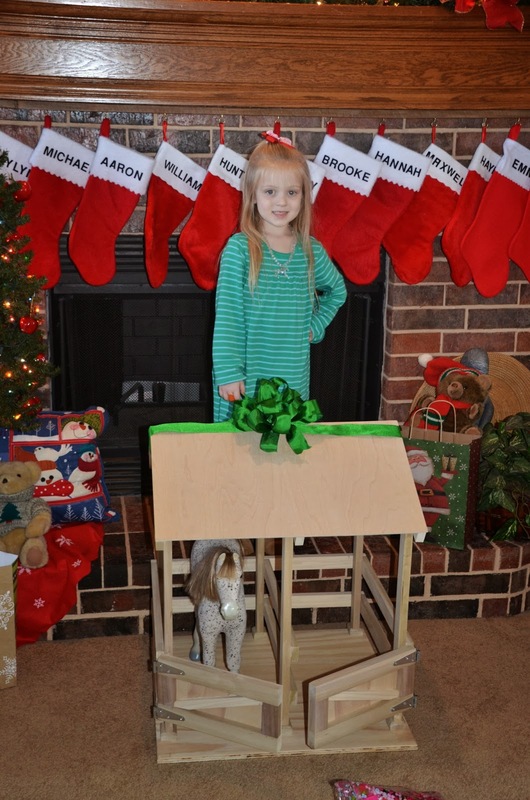 She had NO IDEA there would be a huge surprise waiting for her at Nana and Papa's house. It was so exciting. Her siblings and cousins are all much older than she is, so everyone made a big fuss over her new barn and made her feel super special. It was a sweet Christmas memory I will never forget. LUCKY ME. My family loves and appreciates the homemade, and I have a super talented father-in-law who made my Christmas dream come true!! New Year. New Blogging Goals. 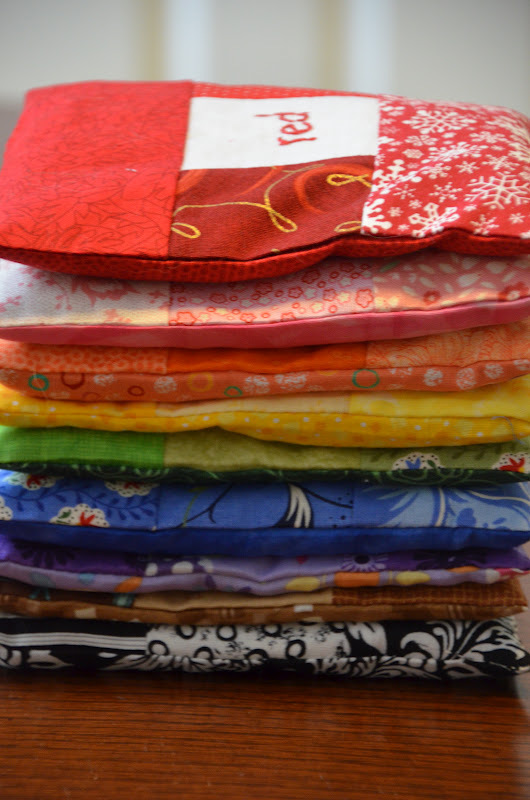 I started this blog intending to record my sewing adventures. I used to share sewing projects on my family blog, but very few of my family member readers are interested in specific Moda lines or pattern names. 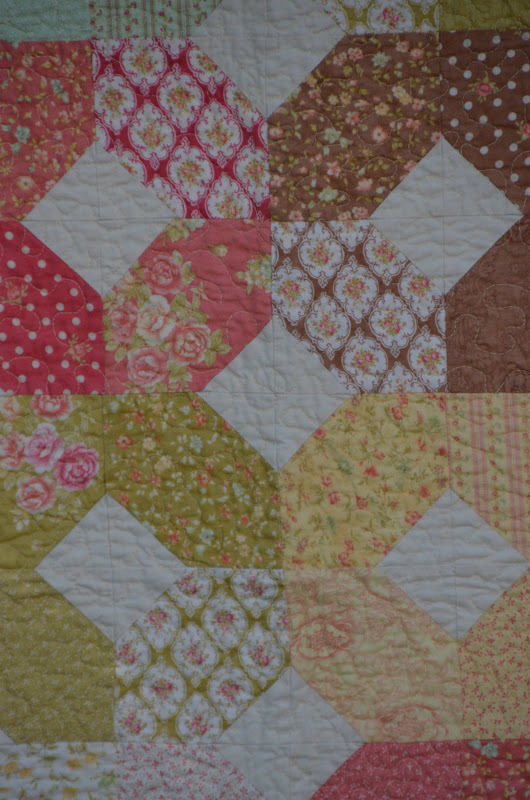 :-) The majority of the blogs I regularly read are specifically quilt blogs, so I thought this would be a fun way to join in that community, but my blogging aspirations proved a tad ambitious. I've left this space quiet (or stone silent!) for quite some time now. Blogging is a guilty pleasure for me, and I set it aside to give more time to other things happening in our household. 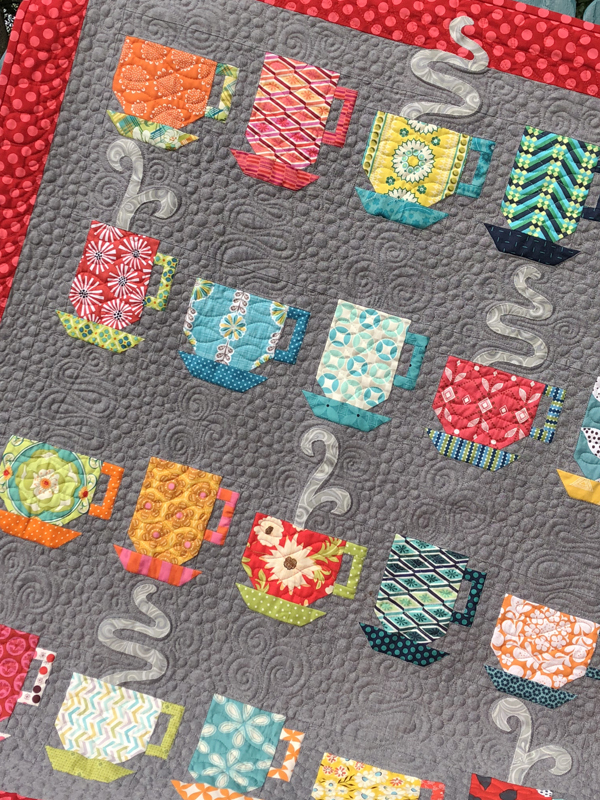 But truth be told, each time I complete a project, I hear a tiny voice in my head that says I should really revive the quilt blog! 1. Don't feel guilty about computer time. I actually did a decent amount of sewing for the holidays, which was a first for me. Also, I kept some of what I made, which is another first! 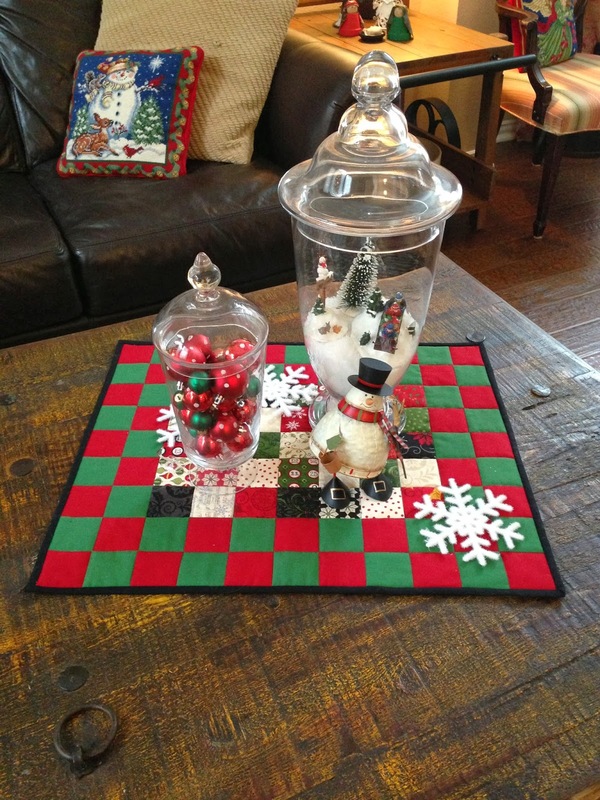 First up, I used fabric from my stash to make a little runner for my kitchen table. I love using my wooden bread bowl as a centerpiece because it isn't too high and doesn't get in the way of conversation. However, I don't want the iron stand it sits in to scratch my tables, so I always keep it on some kind of fabric. 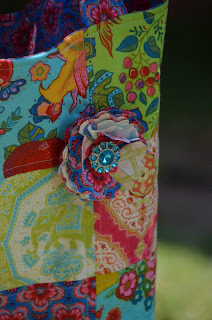 This was made from some old fat quarters I was saving. The black print has cute elves on it. 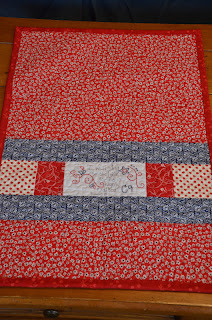 The next little runner (more like a big place mat) was an impulse project born of an impulse purchase! 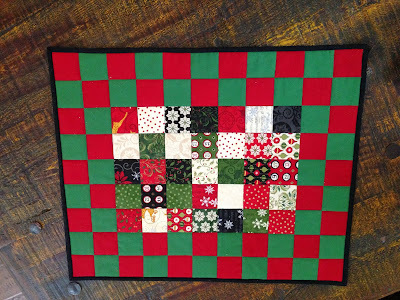 When I was checking out at my LQS on day I happened to pick up a mini charm pack of Moda's Christmas Countdown. I just sewed 35 of the mini charms together and bordered them with some solid green and red squares cut from my stash. I bound this one in black solid. The coffee table in our living room is a massive piece of wood. It is actually made from an old door from an abandoned building in Mexico. I love the table, but it is BIG and DARK and needs something soft and colorful to lighten it up a bit. I hadn't really planned on this project, but it was a happy accident, and I like how it provided a little base for my apothecary jars. Lastly, I used up the scraps from another table runner project and made myself a little Christmas purse. This was so fun to carry during the holidays! I love how soft it is. This pattern is called In From the Cold by Kate Spain for Moda, and I'm just crazy about it. I paired it with a red chevron print for the base and a green print from V&Co. 's Simply Color line for the handles and lining. That big green button was a dollar on sale at Joann's! Score! 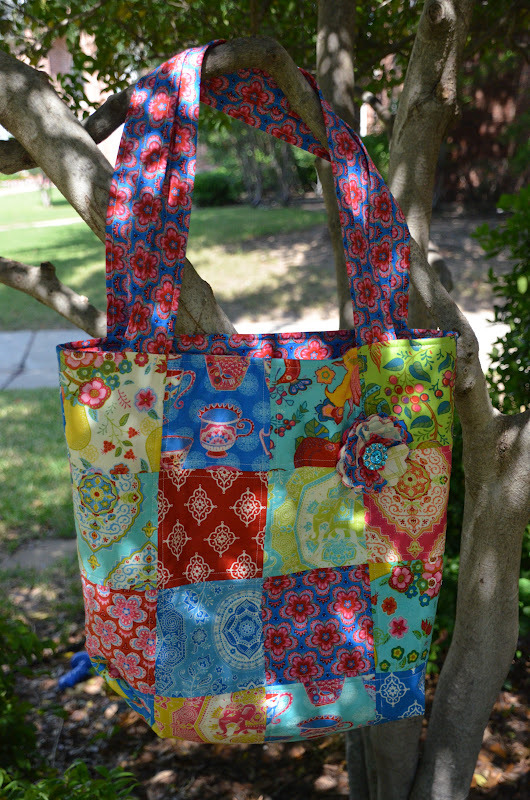 I based the construction of this purse loosely on a pattern called Mill House Inn Tote Bag from Moda Bake Shop. However, I changed the sizing to accommodate the size of my patchwork, which was dictated by the number of scraps I had. It was kind of a figure-as-you-go maneuver! Recently I find that small projects are extremely gratifying. 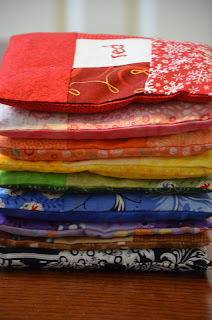 I love making quilts, but I have not had as much time to devote to them this past year. It's sometimes nice to spend an afternoon and end up with a finished project that you can put to use straight away. And that's just what I did with these three! Thank you for taking the time to stop in if you are dropping back by after my long absence. I look forward to posting more of my finished Christmas projects in the coming days! Some time ago I made my daughter a set of rainbow bean bags. I actually made two sets, and tucked one away for a future occasion. A recent invitation to a neighbor's birthday party provided the opportunity to get out the bags, fill them up, and get them ready for a very special little girl. 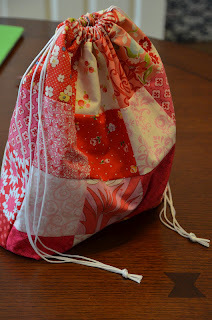 I used some scraps from my Valentine's quilt to make a drawstring holding bag. 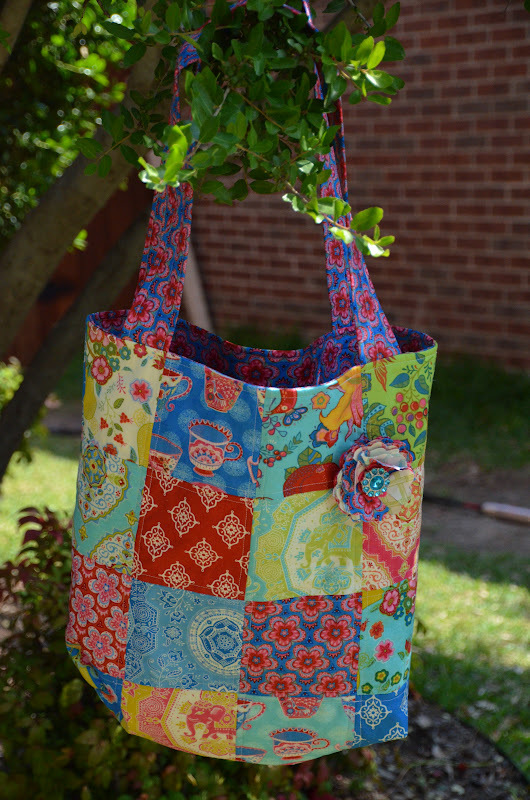 This was my very first drawstring bag, but it certainly won't be my last! What a quick and easy (and incredibly useful!) project. I loved making this. It is fully lined, with a squared off bottom. I googled for tutorials on drawstring bags and combined several techniques to come up with my own pattern. It is incredibly easy to do. 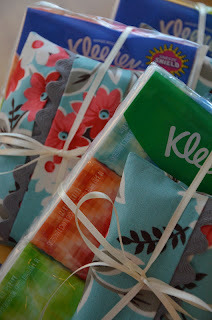 A perfect gift bag for a special homemade gift! 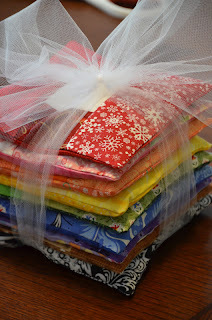 I bought two charm packs of Lily Ashbury's new line called Tradewinds for a quilt. The minute my daughter saw them she begged for me to repurpose them into tote bags. 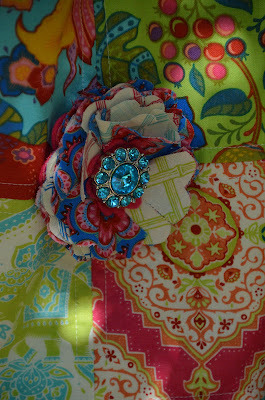 The bright colors and bold patterns in this line are just like that....love at first sight that demands instant use! The color scheme is a departure from my norm, but these brights are so much fun to work with. I used a simple market tote pattern; very basic with straight line quilting, a boxed bottom, quilted handles, and a small pocket in the lining. This one was for my daughter to give to a friend on her 19th birthday. The report was that she liked it a lot. It makes me so happy when my kids and their friends appreciate the homemade stuff. Now I have to make the second tote for my daughter. Hers will have a paler color for the lining. I have it all layed out on my sewing table....just need to get to work. Mother's Day broght a little crafting this year. I made an ipad case for my Mom. I put a quilted pocket on the front to hold her charger. I think I need to start adding tags to everything. I didn't have a pattern for this...I just made it up based on a basic zipper pouch concept. 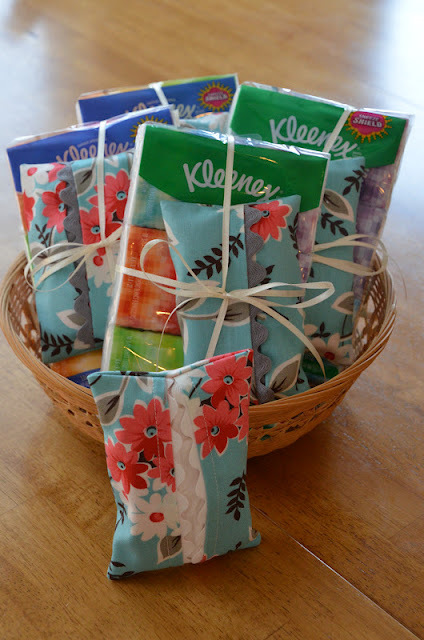 I also made a set of tissue covers. One for each lady at our mother's day luncheon. I followed the quick and easy tutorial from The Cottage Mama. They were fun to make, and practical too! Paired with a pack of pocket tissues, they made a fun and quirky gift, considering there are lots of spring sneezes this year in the south! There is a church around the corner from where we live that offers an amazing music program for children. 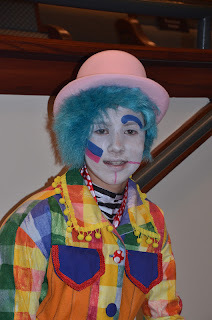 My son has participated in choir there for the past two years with several of his friends. This week was their huge spring performance....a circus theme, and my son played a clown. The woman who directs the youth choir is a talented, generous, patient soul who my son adores! This week marked her 20th anniversary of working with the children at this church. My son wanted to do something special for her to mark the occasion. I've never even met the woman face to face, let alone knowing anything about her color schemes or decorating preferences. In situations like that, I find that going seasonal is pretty safe. I figure even if people aren't into "crafty" or "homemade", maybe they would display a seasonal item briefly each year? So I decided to go summer-y with red, white, and blue. I found this pattern for free online by doing a google search for quilted table runners. (Sorry! I can't seem to find the link again.) The pattern called for only ten blocks, which was super small, so I added five more. Honestly, I would have liked it to be even bigger, but I had a major time constraint. So, this is more of a topper than a runner. Maybe that will give her more options for places to put it? I really like the play of color and design, both of which are on a very petite scale. This is where I got a little greedy. 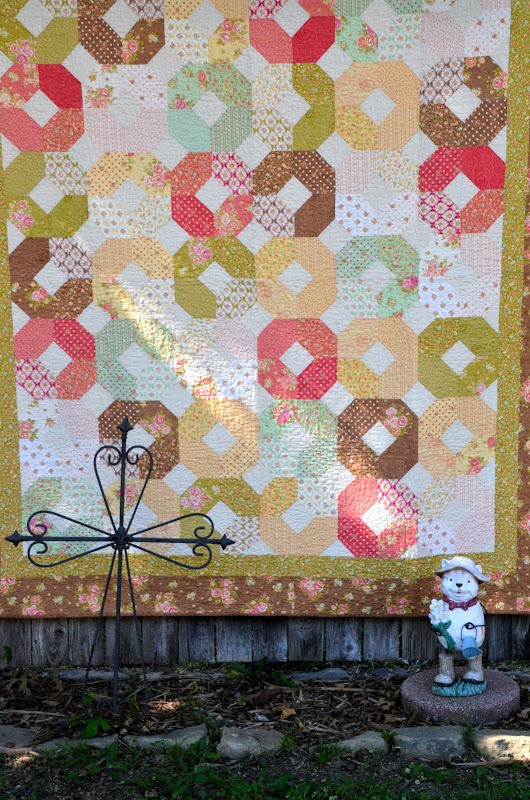 I purchased fat quarters for this project, and when it started coming together I really liked it. Instead, I pulled this small print from my stash and simplified my design for the backing. for He is highly exalted." We purchased a mason jar, some red marbles, a patriotic bow, and a bunch of carnations to include with the gift. My son went out and gathered some greenery to add to the fullness of the bouquet. Of all the quilts I've made, I really do think this one gets top billing as a favorite. I made this for my Mom for Christmas in 2010. My kids call her "Oma", which is German for Grandmother. The pattern was adapted from a Moda Bake Shop tutorial. The "recipe" called for a layer cake, and I substituted charm squares and added borders. I'm consistently drawn to Fig Tree fabrics. The color palettes that she uses are always directly in line with my liking. But this Fresh Cotton line was particularly captivating to me. So soft and fresh. 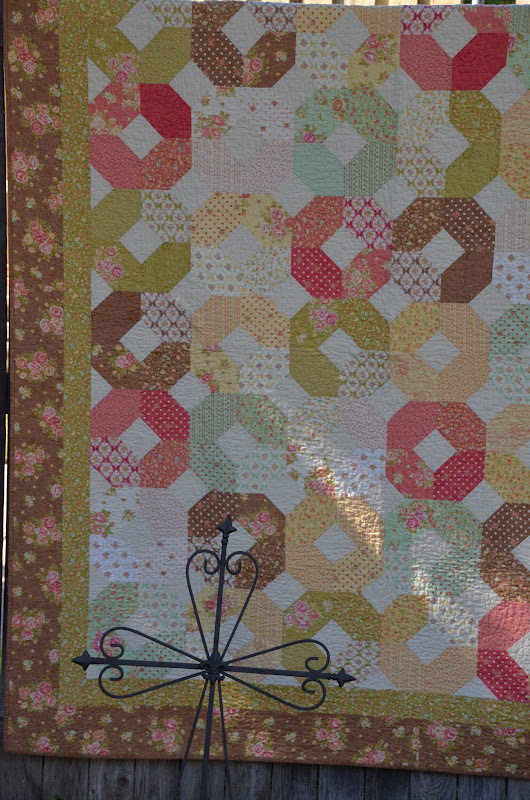 I love the tiny, dainty prints and the general "old time" look of these fabrics. The colors are intense, yet calming. It's just a great look. I think this pattern really showcased the fabrics well too. I stippled this quilt with a creamy yellow thread. I did this on my old machine (my new one was a gift that year!) and the thread gave me absolute fits. I bought it for its color, but the entire experience caused me to forever pledge my loyalty to Aurafil, which is my FAVORITE brand. I went whole hog on the back. 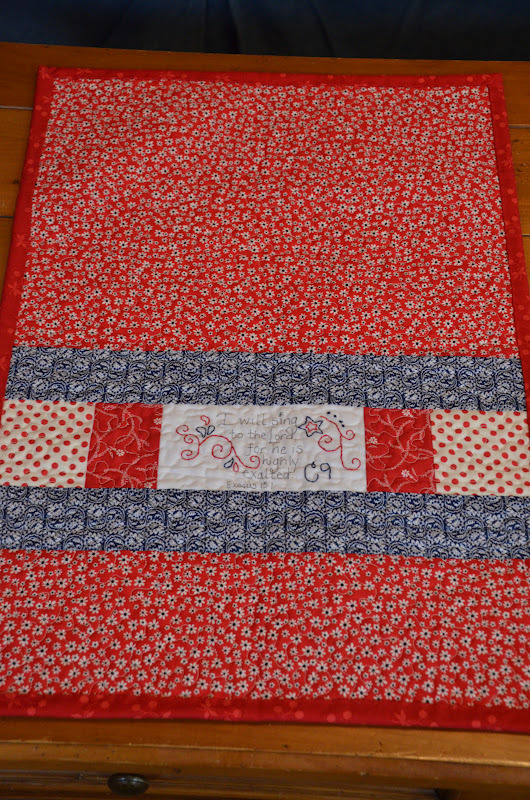 I usually piece quilt backs because in addition to giving it a fun look, it is far more economical. However, I bought yardage of my favorite print for this back. It was a worthwhile splurge. This print completely reminded me of the wallpaper in my grandmother's spare bedroom that I used to sleep in as a little girl. I love this fabric. Bunches. The flower basket embroidery design was a freebie from my LQS, and the verse Hannah chose was Psalm 33:4. The Lord has indeed been faithful to my sweet Mom in so many ways throughout the years. I knew she would be grateful for the reminders of that truth. Thanks for letting me share Oma's Quilt. My husband has more patience than I do. My four kids have more energy than I do. I use creativity as a way to embrace chaos...and hide from it too. 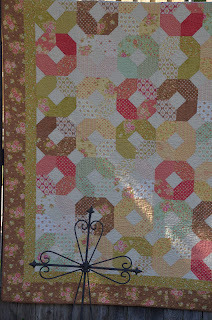 I'm a homeschool teaching, recipe trying, mini van driving Mom, looking for a little time to make more quilts. my shopping addiction and HELP for the mama who is stuck!! Lovely Little Patchwork Blog Tour & Giveaway!